As much as I love having one of Mariuca's famous contests here at my blog, I always have a difficult time when it comes to choosing my winner. I'd dread the closing date simply because the next step requires me to make a final decision, something I sometimes find hard to do, especially when I receive so many wonderful entries. Now that my 2nd Blogversary Contest is officially over, it is time for me to bid farewell to my adorable Mariuca Teddy Bear as he sets sail to his new destination. Though I've had the best time hanging out with my Teddy Bear this month, I am thrilled that he is headed for an exciting new life with his new family. THANK YOU to everyone who took part in the Mariuca Teddy Bear contest, you guys made my 2-year anniversary celebration much more fun and exciting with your participation. Some of you put in so much effort into your entry, which made it almost impossible to single out just one winner. I also love all the names you've suggested for this adorable teddy bear. 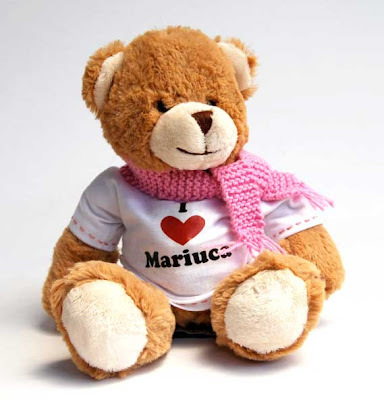 I was much impressed by your earnest creativity in trying to impress me with the best name for Mariuca's Teddy Bear. However, the agreement remains that there will be only one lucky winner and I have to say that this is the hardest selection I've ever had to make for any of the contests at Wishing On A Falling Star so far. Roxy's two lovely daughters, which is one of the reasons Roxy wants to win, even came up with a catchy cheer for BEAR-iuca and it goes a little something like this. Once again, congratulations to Roxy and thank you very much to the rest of my participants. Don't despair if you did not win this contest for you still have a shot at bringing home BEAR-iuca's sister from MPG! Isn't she adorable? You have until the 18th of December to send in your entry so hurry! To find out how you can WIN the MPG Teddy Bear in pink, click here. Thank you to all my participants, Mariuca loves ya! ow! got to excited. ;) congrats to Roxy! i wish we could have another contest like this. so that i could participate now that i have an internet access 24/7. sob. sob. sob. anyway, hugs and kisses to GP. muah!! Ish.. late again.. heheh.. well chop anyway!!! Congrats to Roxy.. I really love the name.. very creative Roxy!! Wah.. he's travelling round the world?? awesome!! GP!! I've not slept at all.. so now I will bid you nitey nite!! hugs and kisses again for GP!! Spreading it around the world is the best part. Oooh, BEAR-iuca is coming to live with us...I just turned my computer back on as London and Maddie were reading bedtime stories in my bed, and they are now so excited they can hardly get to sleep. Now we just have to get to work on sending him on a magic carpet ride around the blogosphere! Hard at work on the BEAR-iuca meme...I'll get you an email before I go to bed. Thank you, thank you, thank you...can't wait to have that cuddly guy here under our Christmas tree. Thanks for your warm wishes...the good news is, you can use your 24/7Internet access to try to win the pink teddy bear over on Mariuca's Perfume Gallery...and we'll be sure to get the Spirit of BEAR-iuca to your blog real soon. Marzie thank you for the linky love. Congrats to Roxi. Congrats Roxy!!! 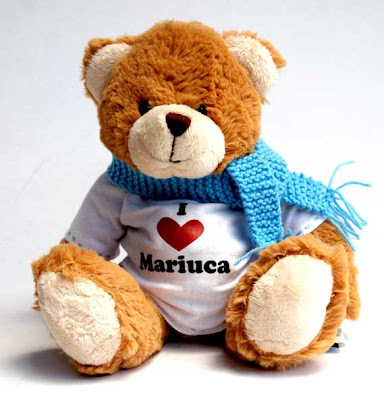 Beariuca is indeed a very good name for Mariuca's teddy! Hey that's pretty neat Mariuca. Congrats Roxy! Congrats Roxy!! Beariuca is off on a journey of excitment & adventure in a distant land! oh no!! oh no!!! i forgot abt my entry, marzie!! no!!! im all shaky now. how could i hv forget abt my bear bear?? oh no!! im so sry, marzie dear!! i am really!! gosh, i must work out my post for my other bear bear! if i missed that bear bear, i think i would hate myself for a week! Hi Bono, so nice to see u here today, how is everything back home? so kind of you to give out the bear! Oh congratulations to Roxy, Maddie and London!! Oh my I was just over to MPG looking for my tag and missed this. I don't have any little girl grand children though. Congrats to Roxy!! Bearica is a lovely name! enewei, just dropping Ecards...and fetching new infos..take care! 9:41pm and it is night-night time already in the Roxiticus Valley...I don't know if I can keep my eyes open to finish my EC rounds! Can't wait till Bear-iuca is here to snuggle up with me & my gurlz. P.S. -- I will email my mailing address. ya, it's cute and unique. never mind, I got a teddy bear from my sister! So unbelievable. I started my EC drop early today. I will be off to accompany my mother to the clinic in a short while. See you again tonight at MPG! Hmm.. got to put on my thinking cap for the pink teddy lak..hehe..
Blue.. you like the name eh.. Me too..lol!! Mmg kena with you lah..lol!! I hope you get your PR back soon! Congratulations to Roxy in this big win! To be honest, I knew she would win as soon as I saw her entry. I almost participated, but I knew there was no way I could top that creative name and I was hoping she would win, even though I don't really know her. This is a fantastic name Roxy! I almost went with Maribeara, which is also a cool name. I'm a little surprised no one else thought of it. I won one contest already and wanted someone else to win. Next time, all bets are off and I'm going for the win!!!!! Aiks! I thot I left a comment here? Must have got lost in cyberspace la. Ok, ok, I didn't leave a comment yet la. I'm still in mourning from not the winning the bear. Congrats to the winner. thanks for sharing the Mariuca Teddy Bear!!! Happy Holidays..